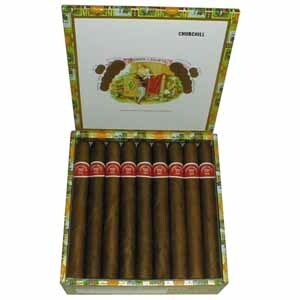 Romeo y Julieta Churchill | Old Morris Tobacconist Victoria BC, Fine Cigars, Humidores and Tobacco Merchantile. Inspired and smoked by the British fat cat himself, The Churchill is a strong, brazen, full-bodied cigar best suited to the expert tastes of seasoned smokers. Despite its legendary strength, it's also a smooth-smoking stick with a masterfully blended opening and an impeccably timed release of subtle pepper, cedar and cream undercurrents. The timeless Gold & Black band is a bonus for any style-hound in the know.